Detective Sergeant John Spartan, also known as the 'Demolition Man', is awakened from cryo-sleep, in the year 2032, to a strange totalitarian utopia ruled over by the sinister Dr. Raymond Cocteau. Spartan is re-enlisted to deal with a mass murderer who is on the rampage. As he investigates the case, he discovers there is more to this regime than initially meets the eye. 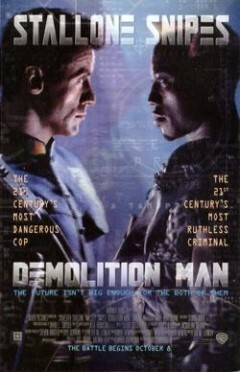 Sylvester Stallone as John Spartan in Demolition Man: "Somebody put me back in the fridge." Sandra Bullock as Lenina Huxley in Demolition Man: "Ahh... smoking is not good for you, and it's been deemed that anything not good for you is bad; hence, illegal. Alcohol, caffeine, contact sports, meat... " Wesley Snipes as Simon Phoenix in Demolition Man: "Wait a minute, this is the future. Where are all the phaser guns?" John Spartan is a muscle-bound action hero, thinly disguised as an old fashioned cop. He was put into cryogenic sleep as punishment for his troublesome methods of catching criminals: basically ‘demolishing everything’. Now it is ‘the future’, and John Spartan has been thawed out for one last desperate mission: his arch nemesis Simon Phoenix has escaped from his cryo-cell and is causing havoc in the heavily placated society of the future which simply cannot cope with this neanderthal killing machine. So, as John says: “Send a maniac to catch a maniac”. John is not exactly happy about this, but since his only other option is to go ‘back in the freezer’ he reluctantly agrees, only to find himself in the middle of a conflict between two extremely segmented layers of society. Stallone as diplomat? You just have to be there. John Spartan: You’re gonna regret this the rest of your life… both seconds of it. John Spartan: Huxley, enough! This isn’t the Wild West. The Wild West wasn’t even the Wild West. Hurting people’s not a good thing! Well, sometimes it is, but not when it’s a bunch of people looking for something to eat!